Summer isn’t the only season for hiking in Breckenridge. Sunny days and well-traveled trails allow you to experience the beauty of the backcountry, even in the winter. When you choose a trail, try to find one that will be packed down if you plan to use your boots. Snowshoes will expand your options. Yacktracks, a type of traction system that can slip on over the bottom of your boot, can also help you hike where boots might be not enough. 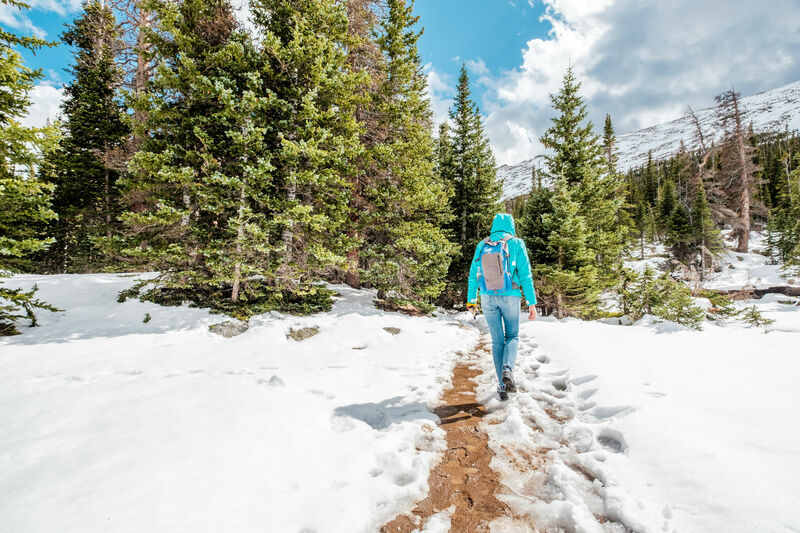 These can be purchased at almost any outdoor gear store in Breckenridge, and will prevent you from slipping and sliding on a snow packed trail. Any of the trails close to town will be consistently packed and easy to access. The Peaks Trail runs along the base of the ski resort. It meanders through beautiful woods and offers stunning views. The trail goes a full eight miles to Frisco, but you can walk in as far as you like and turn back. Wellington Trail starts off on Wellington Road and ends at French Gulch Road. It is 1.4 miles to the end point, making it a 2.8 mile round trip. Once you hit French Gulch Road, you can access several other popular hiking trails, if you want to keep going. The hike is easy over rolling hills with little total elevation gain. You will also be treated to old mining remains along the way. This trail is a 0.7 mile loop that is perfect for a quick stroll. The trailhead is found at an easily accessible parking lot off of Airport Rd. The trail includes remains of the mining industry with interpretive signage so that you can learn as you hike. The hike only gains 205 feet. If you are still adjusting to the altitude, this is the ideal trail to warm up on. It is also a great setting for families with young children. This trail is also for hikers only. When you would prefer not to encounter fat bikes or cross country skiers, start here. This road is closed in the winter to motorized traffic. 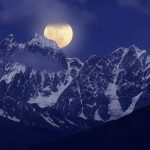 It is often traveled by cross country skiers, snowshoers, and hikers. This road goes all the way to Como, but you don’t have to go far to enjoy beautiful views and charming forest. Parking is easy and the road is simple to access. 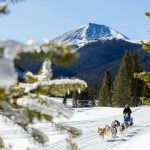 There are a variety of trails you can access throughout Breckenridge. Keep in mind winter conditions can vary greatly. A warm, sunny spring day may mean a wet and muddy trail, while a cold night might result in a very slick trail. Be sure you are prepared with plenty of layers. A comfortable morning can very quickly turn into a snowy afternoon. Always carry plenty of water and snacks with you. Even on a short trail, you may find yourself delayed. Fat biking is also popular on many of these trails, so be prepared to watch for others and share the trail. 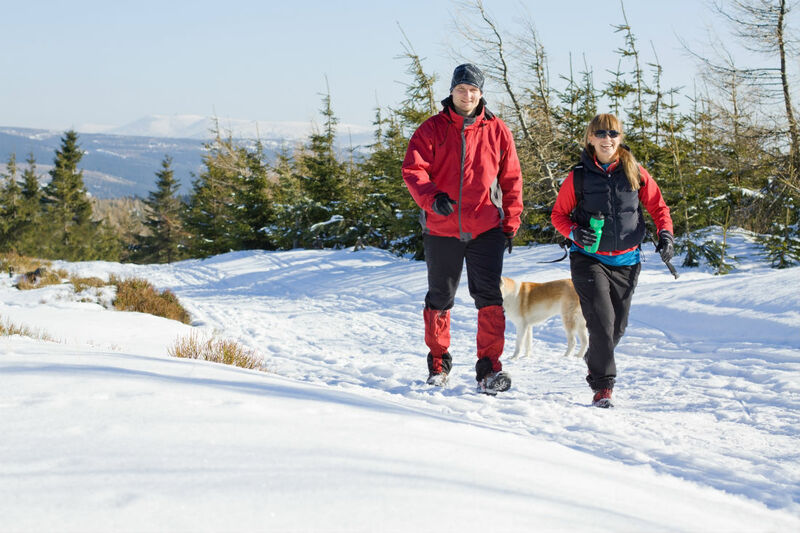 Hike in the winter and enjoy your favorite trails with crisp white snow and stunning snowcapped mountain views. Sleep is an integral part of your health. Stay well both physically and mentally with these five tips for improving your sleep. 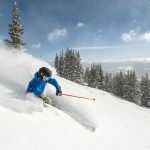 A post skiing sports massage in Breckenridge can help sore muscles recover from the workout and get you back on the slopes faster. Breckenridge is a winter wonderland, often until late in April. If you have come for your ski vacation, but feel like you need a change of pace, there are plenty of other options available. Wondering what to do in Breckenridge? How about a cross country skiing! 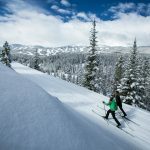 Check out our favorite cross country ski trails in Breck and the surrounding areas. What is Swedish Massage Therapy? Swedish massage therapy has been used in the United States for over 160 years and is an excellent way to relieve stress or muscle tension. Book a Swedish massage in Breckenridge today at our spa.